• Nutrition - starting in the first trimester, it is important to eat a health diet, including whole foods, lots of water, and a quality food - based prenatal vitamin. One of the most important nutrients for moms is protein, which provides amino acids, known as the building blocks to cells. With adequate nutrition, not only will you be growing healthy babies, they may also have a better chance of making it to full term, which also increases your success of a natural birth, while decreasing their risk of NICU time. Good protein choices are lean meat, eggs, low mercury fish, beans and legumes. Additionally, it is important to “eat the rainbow,” meaning many colors on your plate - think red peppers or strawberries, green broccoli, kale or spinach, oranges or carrots, yellow lemons or bananas, as each colored whole food provides different key nutrients and vitamins. Drinking plenty of fluids will ensure babies have enough amniotic fluid, contractions don’t start prematurely, and can help keep your fatigue at bay. To combat nausea, try not to get too hungry, and keep bland snacks like cereal or dried fruit nearby. • Exercise - Once given the go ahead from your provider, prenatal exercise is another essential part of maintaining a healthy pregnancy, and will prepare yourself for birth. Prenatal yoga, walking and swimming are all great options. A walk outside also gives the added benefit of vitamin D! When in doubt, consult before trying something new, and avoid heavy lifting, torquing maneuvers or high impact exercises, unless it is okayed. During pregnancy, the babies need to get in optimal birth positions, and avoiding strenuous abdominal exercises, as well as doing weight bearing activity, can help make that possible. As your pregnancy progresses, a maternity cradle, or wide, elastic band will offer support when standing or walking for long periods of time. If you are placed on bed rest, ask if there is still any exercise you can do, such as leg lifts or arm exercises, because even a little movement may be beneficial. You can also practice gentle breathing techniques, such as longer exhalations than inhalations or blowing, which may be helpful to use during labor. • Childbirth Education - Take a class with a local educator, watch natural birth videos, read childbirth preparation books and talk to experienced parents so that you have the knowledge to make an informed decision about your birth preferences, including place of birth. A natural birth can happen at home or in hospital! Research your birth preferences but be flexible. Decide which aspects are most important to you, and also what part of your plan you could modify, in case things change. In birth, preparation is helpful so you know what to expect, but the unexpected can occur, and its important to know why an intervention is being offered or recommended. 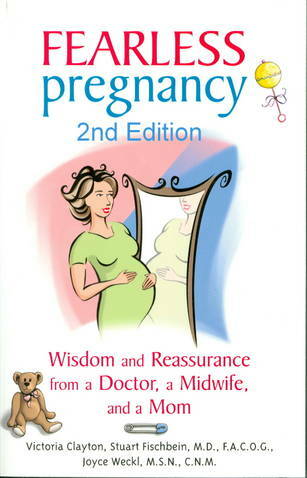 • Self Confidence - now that you’ve ate healthy, exercised gently, and feel informed about labor and birth, hopefully you can enjoy your pregnancy! I know easier said than done, but remember people have been giving birth forever. Once you’re pregnant everyone has some piece of advice to offer, so take in the positive, and let the negative stories go. Find affirmations or images that make you feel empowered and strong. These can be your mantras during labor and birth. Another essential is trusted a labor companion, which could be a friend, relative or partner, and statistics show that someone with a birthing person throughout their birth is the best thing you can do to reduce number of medical interventions. Remember, this is a special time and you can do it! Here is our first family photo: happy, healthy and at tucked in at home!